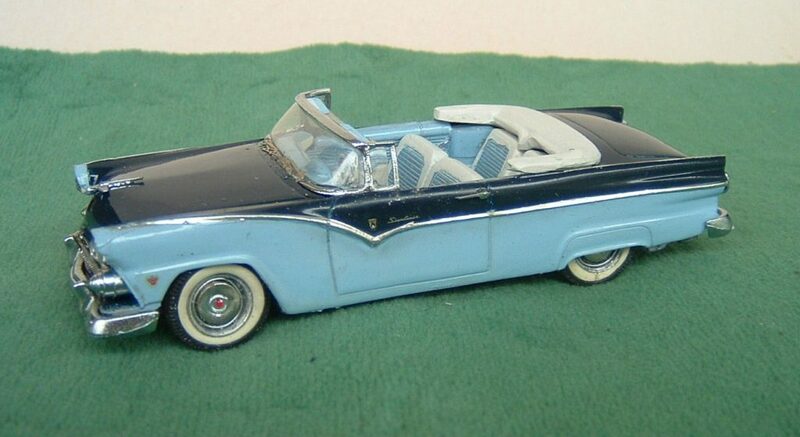 There was an old French kit of a 1955 Ford Sunliner found on eBay so I purchased it and built it as a companion to my earlier CCC model of a 1955 Crown Victoria “glass top”. 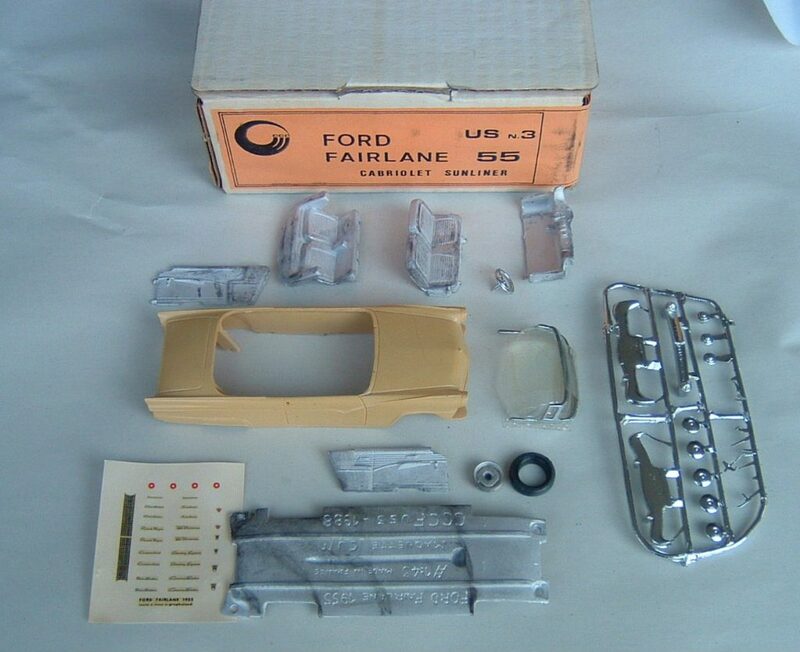 This kit contains a resin body, white metal interior parts and base, and chrome bumpers and hubcaps. 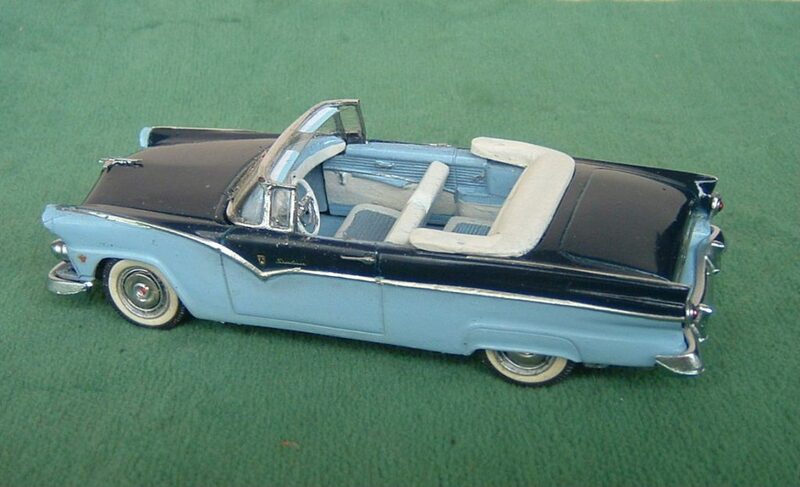 The hub caps were of the small type, colloquially known as “dog dish” hub caps but virtually all up market convertibles would have come with the full wheel covers. So using photos and the full size ones on my Victoria I created full size ones with some chrome rivets and wire rings. The kit was so old that the black wall tires broke apart when trying to place them on the wheels but I was able to substitute more realistic white walls from my inventory of bits and pieces for model building. Using Google images and the colour brochure web site I chose a dark blue and light blue two tone colour combination which is quite handsome. The interior got the correct factory two tone in white and light blue. 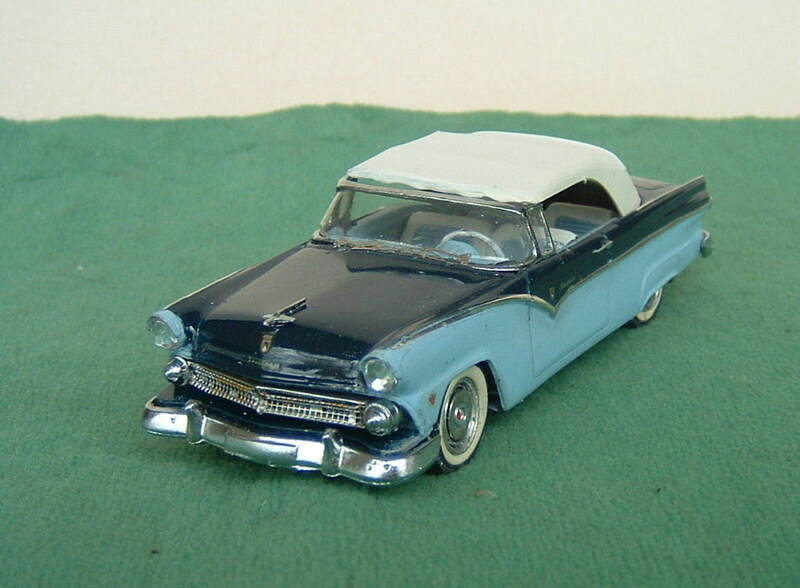 Also found in my spares a white roof from a long ago project of converting a Solido 1950 Buick convertible into a woody station wagon with a Provence Moulage transkit. (where has the transkit activity gone? It was great fun back in the day) Editor: I understand that sales were poor as the cost of a base car and transkit was about the same as buying a full kit. Certainly the interesting Kager kits, made by Provence Moulage, seemed to be part of shops price lists for a long time after they were launched suggesting that they were poor sellers..
As with many low production 1:43 scale kits there is always some trial and fitting and fettling work to produce a good result. 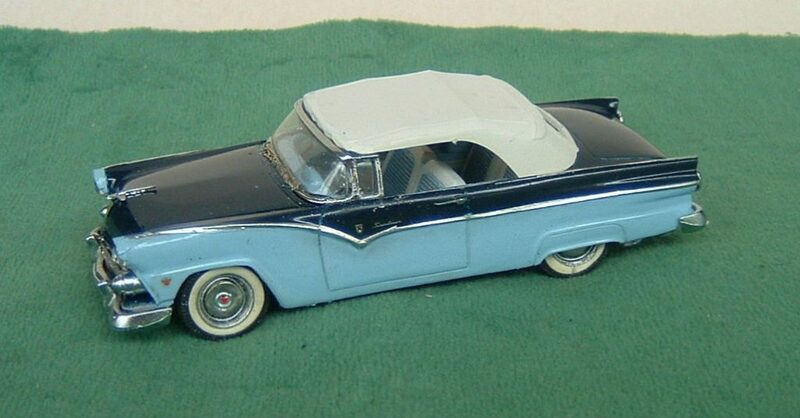 Most interestingly, the decal sheet that came with the kit has decal badges for Country Squire (the wood sided wagon) the Country Sedan wagon, the Ranch Wagon, (which was the two door version) the Customline sedan, and a Town Sedan. I really wonder if the producer of CCC kits was planning more versions that never came about. Much later Trax of Australia has done the mid line Customline sedan in both maroon and green.